AGBU Alexander Primary School - Blog: WE ARE CODING ANOTHER LANGUAGE @ ALEXANDER SCHOOL! WE ARE CODING ANOTHER LANGUAGE @ ALEXANDER SCHOOL! As a bilingual school, one may think learning two languages simultaneously is already a challenge in itself - specially if one is English and the other Armenian. 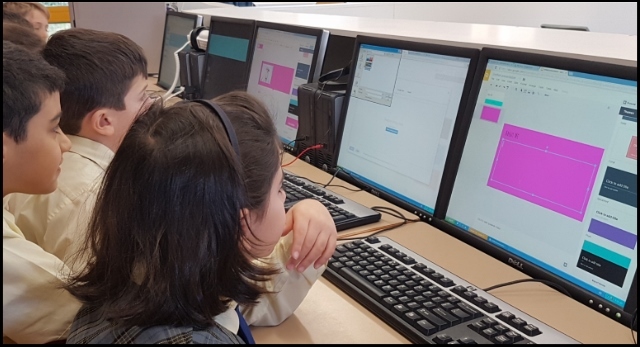 However, for students at AGBU Alexander Primary School and right around Australia, one of the most important languages they may all need to learn is also the language of computer coding. It might sound strange, but language of coding or computer programming will soon be the most commonly understood in the world. We all agree that computer software is a growing field and allows for a great job outlook as well as entrepreneurial potential. As such, coding skills are incredibly useful for today’s students to learn, but it’s not just due to job prospects. Since today’s most interesting tools and platforms can all be manipulated by coding, having coding skills is also a great jumping off point for greater independence creativity. It’s hard to imagine a single career that doesn’t have a need for someone who can code. Everything that ‘just works’ has some type of code that makes it run. Coding is all around us. It is the language that makes things happen. Its meaning is functional and practical, as it achieves instant results. Much like traditional languages, coding is also limitless in its creative potential. There is no end to the ‘on-screen’ events that coding can instigate. In digital context then, coding is the language of everything. That’s why more and more Australian students are coding. They see in coding the tools through which they can access a vast future of creativity and productivity. Coding and programming is no longer a hobby for the ‘computer whiz’ in their twenties, hunched over three monitors... not any more! The newest coders have just begun primary school! With coding set to take the world by storm, it’s our duty as educators to prepare students for the future, for jobs that will eventuate in this area. Coding is the primary tool through which manufacturing jobs are being automated, so it is reasonably easy to predict that coding will play a much more important role in future curricula. This means that any forward-looking school should be seeking to develop models that can see coding become part of the school culture. At Alexander school, we have set a high standard for ourselves, by trying to go above and beyond so that coding becomes a part of students’ everyday language. While the Digital Technologies component of the Australian Curriculum tries to cover this content in the later years of primary and across Years 9 and 10, it is still behind compared to other countries. For example, in the United Kingdom’s computing curriculum there has been a clear shift away from using technology to making it. In other words, since 2014 the UK has joined the coding ‘C’ with the three Rs. Today, there are many resources for people to learn code. The Barbies and GI Joes of yesteryear have become tablets and smart phones. As I have stated in the past, gone are the days when we used computers at Alexander school to do ‘things differently’, the time has come for teachers to use the computer and other modern educational technology and do ‘different things’ in the classroom. The employees of the future need to be able to think outside the box and do different things in order to have a competitive edge over their counterparts. This is the reason why we are coding another language… because we simply have the means to deliver this at Alexander school!